Her hair and breast the coming holiday. Among the companions of her lovely prime. At the whitening of the moon. The hour of heart's renewal. And ruminate about his day of rest. To end his task before the morning breaks. Most cherished, full of joy and expectation. His mind to his habitual travail. Anticipating the great feast of life. My child, enjoy the season. Seems slow in coming, do not grieve to much." - "The Village Saturday" (Il sabato del villaggio) written by Giacomo Leopardi in September 1829, translated from the Italian by Ottavio M. Casale, in A Leopardi Reader, Urbana, University of Illinois Press: 1981. How I wish that I had discovered Giacomo Leopardi years ago, in college maybe, instead of floundering through in the longueurs of The Divine Comedy or The Fairie Queen. Leoaprdi wrote Il sabato del villagio during his last stay in his home town of Recanati, a commune in the Papal States that had been conquered by Napoleon Bonaparte just three months before the poet's birth. The place where he felt trapped, at odds with his parents, and taunted by other boys was also the place where dreams and memories began. Leopardi once compared nature to childhood, its energy reaching toward a perfection that is momentary. 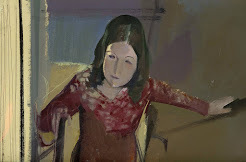 We can question ourselves whether the child in the poem is one of the boys who taunted the poet or whether the old woman toiling away at her loom is a stand-in for the young and lovely Sylvia who he watched from afar at her spinning. But only after we accept the poet for what he was – an impassioned, honest, and deeply moral being. The musicality of his verse seems effortless; his life was anything but. To Italians he is second only to Dante but Giacomo Leopardi is much closer to us, a modern in his humanism and his skepticism. Nietzsche wrote of Leopardi's poetry, “Long passages are fit to repeat in lieu of prayers through all the watches of the night.” Schopenhauer the pessimist lamented that he never got to meet Leopardi, his "spiritual brother." Progressive scoliosis which first appeared during Leopardi's adolescence made love, marriage, and children unattainable ; it also let him vulnerable to the cold, an additional torment in the times before central heating. Tormented by other boys for his deformity, Leopardi came to see himself as “ a walking sepulcher.” He also suffered from periodic bouts of blindness caused by eye strain. And yet there are many accounts by those who knew him of his truly beautiful smile. Leopardi “abhorred" the provincial town of Recanati, where his parents presided as Count and Countess. They have been characterized as practicing a “medieval” type of Catholicism; he came to despise the Church whose dogmas seemed designed to mock his suffering. He tried to explain human woe in human terms. As a young man he had hopes of securing a position with church or government that would free him from financial reliance on his family, but his writings offended officials. He fell in love with three women that we know of, all were married and unattainable yet they allowed the young man close enough to nurture hope. Successful and admired though his poetry, prose, and translations were, for Leopardi more than most of us, his desires far outran reality. To Italians he is second only to Dante but Giacomo Leopardi is much closer to us, a modern in his humanism and his skepticism. Nietzsche wrote of Leopardi's poetry, “Long passages are fit to repeat in lieu of prayers through all the watches of the night.” Schopenhauer the pessimist lamented that he never got to meet Leopardi. Throughout his short life, Leopardi kept reaching out to other people no matter how often he was rebuffed; he understood that humans need each other. Plagued by loneliness though he was, Leopardi took great pleasure in reading and writing and he easily outstripped his teachers, one after another. His candor stands as a rebuke to academics who posit a "biographical fallacy", the better to ignore the artist in favor of whichever theory they have hitched their professional stars to. Ever restless, Leopardi traveled from Milan where he edited the works of Cicero to Bologna to Florence, the city where he published I Canti, his greatest work, recently translated by Jonathan Galassi (New York, Farrar Straus and Giroux: 2010). Leopardi died on June 14, 1837, two weeks before his thirty-ninth birthday, far from Recanati, i a villa over the Bay of Naples. If the story of 19th century European art were not so Franco-centric the name of Giovanni Fattori (1825-1908) would be better known. His working lifetime overlapped with that of Corot and then Monet, artists who need little introduction. 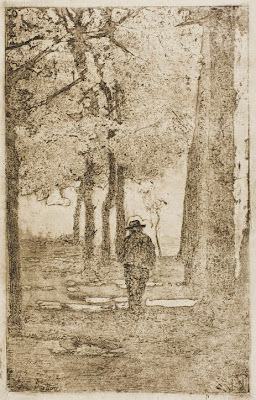 Fattori's art began with historically-themed paintings and then works that we might place within the Barbizon style and a late flowering of etchings, several now in the collection of the Art Institute of Chicago. 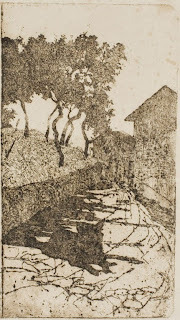 Fattori is considered to be the per-eminent artist of the Macchiaiolli, a group or movement that began in Florence. One obvious difference from their French counterparts, most of whom were or aspired to be members of the bourgeoisie, was their shared youthful involvement in the revolutionary movements of 1848. Another is implicit in the name Macchiaiolli (its root in the word macchia, meaning patches of color), their paintings often dominated by bold strokes of color they had learned from paintings by Rembrandt and Tintoretto. 1. 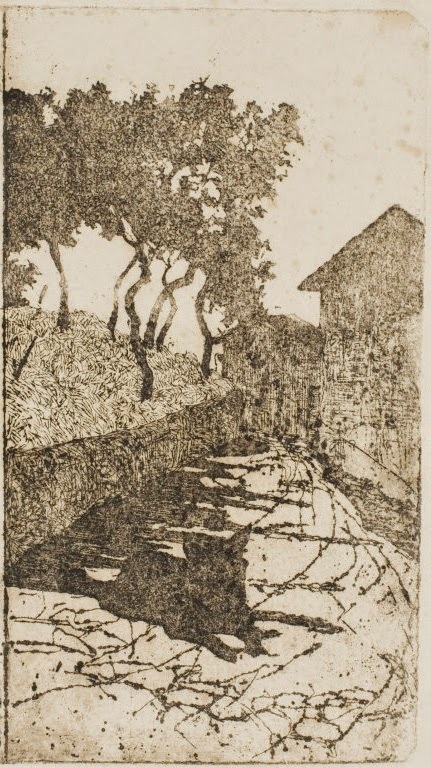 Giovanni Fattori - White Road, no date. 2. 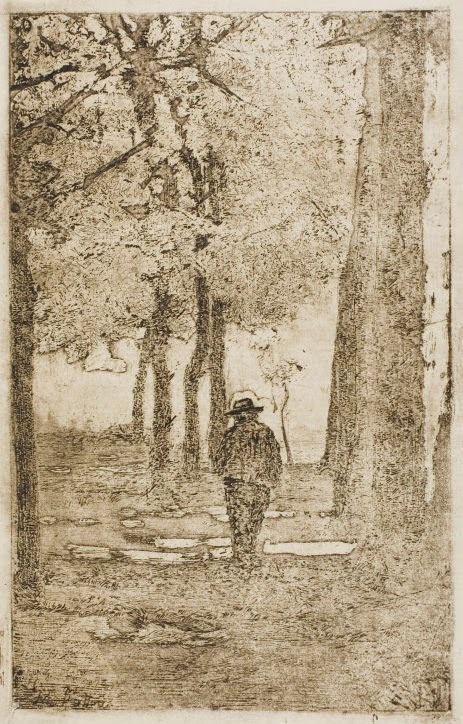 Giovanni Fattori - Wooded Walk With Figure, no date, Art Institute of Chicago. 3. Giovanni Fattori - The Black Dog, no date, Art Institute of Chicago.